And when [Jesus] got into the boat, his disciples followed him. And behold, there arose a great quake in the sea, so that the boat was covered with waves; and [Jesus] was sleeping. And they went and woke him, saying, "Lord! Save us! We're perishing!" And [Jesus] said to them, "Why are you being cowards? Littlefaiths!" Then [Jesus] got up and rebuked the winds and the Sea, and there was a great calm. And the men marveled, saying, "What sort of man is this, that even the winds and the sea are obeying him? "Jesus said what? He called his disciples what? I don't believe Jesus would say something like that. Some thing isn't right here. This must not be translated properly." This is the kind of reaction I can imagine Christians having, especially if they're sensitive to the idea that saying anything disrespectful could ever possibly be "godly." Well, even though some people think that kind of sensitivity has it's place in the kingdom of God, it certainly could not have it's place under all circumstances, otherwise the Lord himself wouldn't have said it. What did they do to deserve the description of "cowards" and "littlefaiths"? 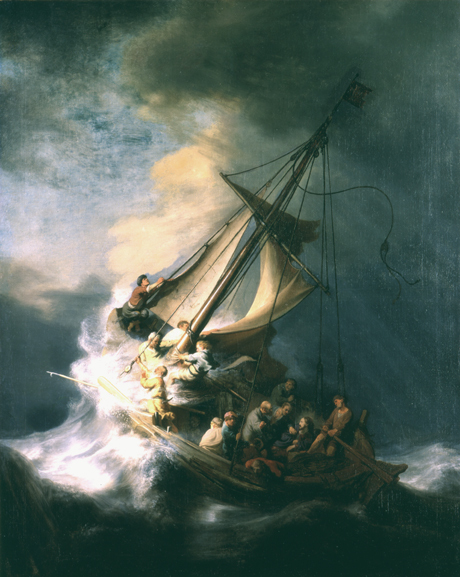 Wouldn't it have been foolish to let their boat sink and to let Jesus sleep through it all? And what is there not to admire about fleeing to Jesus in times of trouble? It seems to me that there are multiple methods which could be employed to misinterpret this story. We could blame Jesus. We shouldn't, but we could. Maybe he was cranky because he didn't get enough sleep or his blood-sugar was too low, and this is merely an example that being cranky isn't necessarily a bad attitude. Or maybe, Jesus is acting this way because his disciples didn't pray to their Heavenly Father first. Maybe, Jesus is criticizing them for waiting too long to wake them up. Maybe. Well, on second thought. No, none of those options are viable. What Jesus is really criticizing is their despairing fear and fits of anxiety. In fact, if you look closely at the text, it's as though Matthew is recording the three words that Jesus remembers hearing in the midst of his deep sleep. It was as though everything Jesus heard was fuzzy sounding, and the main gist of what he heard were three shouts of sheer panic: "Lord! Save us! We're perishing!" At least the disciples got it right by addressing him as "Lord," and not "teacher" like the scribe did in the last narrative (8:19). Admittedly, it seems natural for human beings to panic in circumstances like these. One minute they're hanging out on deck looking up at the clear blue sky. The next minute a great earthquake nearby makes waves so high that the boat is covered with water. I would be shaken a bit too (pardon the pun). ...do not be anxious about your life, what you will eat or what you will drink, nor about your body, what you will put on. Is not life more than food, and the body more than clothing? Look at the birds of the air: they neither sow nor reap nor gather into barns, and yet your heavenly Father feeds them. Are you not of more value than they? And which of you by being anxious can add a single hour to his span of life? And why are you anxious about clothing? Consider the lilies of the field, how they grow: they neither toil nor spin, yet I tell you, even Solomon in all his glory was not arrayed like one of these. But if God so clothes the grass of the field, which today is alive and tomorrow is thrown into the oven, will he not much more clothe you all, you littlefaiths? Therefore do no be anxious... But seek first the Kingdom of God and his righteousness, and all these things will be added to you. This direct address as "littlefaiths" is not a curse word, but it is name calling. And I bet it wasn't until Jesus called his disciples "littlefaiths" again that they made the connection and recognized that God had brought about the sudden earthquake to test their faith in Him. But Jesus was ready. Jesus was apparently always ready for each test that our Heavenly Father gave him. Surely Jesus was fully God and fully man, but this doesn't diminish the reality of the testing he still needed to endure throughout his human life. And this is a healthy reminder for us today too. When we are faced with real tests in life, what will our responses be? Will we cower under pressure? Will we panic? It seems that the most common reaction to severe testing is that most of our thoughts and emotions are consumed with tension, angst, worrying, and general uneasiness because of anxiety. Will any of those be your reactions too? Should any of those be your reaction? Jesus shows us that we should not be anxious. And the reason why we ought not to be anxious is because all fits of anxiety are an expression of little faith. Jesus knows that our tendency is to strive for as little faith as possible. We want to walk the comfortable road, coddled all the way to eternal life. But Jesus wants big faith in all of his disciples because he knows that big faith is always willing to conquer through the uncomfortable roads of real life. He knows there are a lot of littlefaiths out there in the world. But he wants bigfaiths. In fact, I wouldn't be surprised to find out in heaven that one of Jesus' greatest joys in life is namecalling, especially with names like "Bigfaith." Jesus wants disciples who seek first the kingdom of God and his righteousness, which is another way of describing those whom he loves to call "Bigfaiths." There is also one more thing we learn from this story. We learn that Jesus accepts even a little faith. He does not admire littlefaiths, but he loves and cares for littlefaiths. Notice that as his disciples were trying to wake him up by screaming at him, Jesus didn't pull the blankets back over his face and tell his disciples to go away. And he didn't wake up and walk on water to get away from them either, as though the sinking ship was their unique problem for being littlefaiths. Instead, Jesus gets up and calms the wind and the Sea for the sake of his disciples. First he rebukes them for their cowardice, but then he helps calm them. So when you are faced with God's providential tests, and you realize you're caving in to the temptation of anxiety and fits of despair, keep in mind that Jesus is able and willing to calm everything down for you. And he's willing to calm things down for you because he's the one you're coming to with even a little faith. He could ignore you. He is sovereign. But if you are his, you know his holy character which cares for you through every storm of life. And because you know He cares for you, you should cast all your cares upon him. But keep in mind that we are not really casting all our cares upon him if we are not willing to receive his rebuke about our faith being cowardly and little. And we are not really seeking first the kingdom of God and his righteousness if our primary focus is upon the Lord's help to calm the storm's of life. Instead we ought to be asking him for help to make our faith bigger. When we feel like a particular burden is going to become too big to carry, we should be willing to ask first that God would give us stronger backs. We ought to be seeking first the kind of life which deserves better name calling from God. We should be asking God to help us conquer through the uncomfortable paths of life according to His word and Spirit to become worthy of the name "Bigfaiths." If we are really interested in seeking first the Kingdom of God and his righteousness, our feelings of anxiety must be replaced with the wisdom of our Lord's rebuke.